Made of standard materials, with a minimum chain pitch of 7.5mm. Enables a 19mm dead space between conveyors by using a minimum R3 nose bars. Ideal for stable conveyance of items that easily deform and small items. Uses a slit pin integrated with the plug for chains with 50mm and 100mm widths. Reduces noise by 6.5dB on average compared to chains with a 15mm pitch. B Blue ▲ Contact us for details. LFW White ▲ Contact us for details. LFB Brown ▲ Contact us for details. NLF Dark gray ▲ Contact us for details. WR Dark green ▲ Contact us for details. E Black ▲ Contact us for details. 1.Values for max. 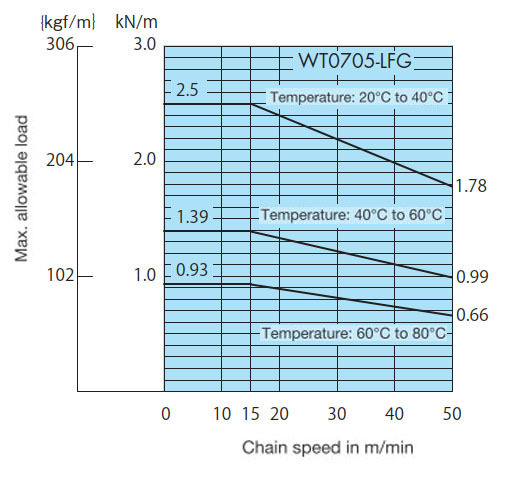 allowable load are at ambient temperature (20℃) and assume that tension acts uniformly over the entire chain width. ▲：Special configurations may be available. Contact a Tsubaki representative for further information. 3.Operating temperature of ( ) is for wet conditions. 4.Maximum allowable speeds in ( ) are for when using nose bars made of UHMW-PE. Nose bars made of SJ-CNO (special polyamide) must be used under dry conditions without lubrication. 5.Standard chain width is in 50mm units. Custom chain widths and widths greater than 500mm are also available upon request. Please contact a Tsubaki representative for more information. 6.Chain width X shown is a nominal width. Chain width is subject to expansion or contraction with changes in temperature. Expansion/contraction rate is 0.00015/℃ based on reference temperature of 20℃. 7.The chain width should be less than 1500mm if the operating temperature exceeds 40ºC. The plastic rail has no heat resistance or chemical resistance. Contact a Tsubaki representative when using in special environments or usage conditions.